First of all, sorry for the long lapse in this story… The end was not in Cabo Higer, even though at that moment I had indeed crossed the Pyrenees from one end to the other, but as I had mentioned before, Benasque, in the middle of the mountain range, where I was meeting my sister. That was the reason why I had been skipping one mountain pass out of every two since I had past that point on my way west, because I was now going to ride the remaining passes on my way back to the east until Benasque. When I got down to writing the last two days of this trip I realised that all the photographs I had taken those two days had vanished. I was really pissed off, since some of them were really good, especially the ones in La Rhune, and I spent some weeks desperately searching through all my memory cards, portable hard drives and USB flash drives, all to no avail. In the end the holidays were over, I got caught up in work again and forgot to finish the story. The sea was covered in mist by dawn when I woke up, and by the time I had had breakfast, packed up the tent and loaded the bike the sun still had not managed to break through the thin layer of cloud that covered the sky. It did not look as if it was going to rain, but it was surely going to be chilly. I rode out of the campsite and headed down tot Hondarribia to fill up the tank for the day. I soon ran into the morning rush hour, and as I was halfway through the traffic jam it started to rain. So much for my weather predictions… I stopped at the first petrol station I saw, at the edge of town, near the border, part of the usual cluster of shops selling tacky stuff one can find near borders. A very chatty attendant filled up the bike and I took the chance to put on the rain cover over my suit while she made comments about the rain, the traffic and how it was going to get worse with the rain. Protected from the drizzle and with a full tank, I left the traffic jam behind and blasted out of town following the same road along the border with France that I had taken the day before. When I reached Bera I turned off the main road and crossed an industrial state. I thought that even though it was just as ugly as any other around the country the rain, lush green vegetation and Atlantic climate in general made it a lot more tolerable to the eye. The estate turned into a much nicer little town and thanks to the GPS I quickly found the small road through the forest that was going to take me up Collado de Ibardin, the first pass of the day. Yet another amazing and little used road took me down on the other side to the main French road, the D4, and the first stop, shortly before Sare, for the highlight of the day: the La Rhune Train. La Rhune, or Larrún in Spanish, is a peak on the border between France and Spain. At 905 metres high it is far from being the highest point of the Pyrenees, but it stands alone, thus offering stunning 360º views of the region, all the way to the sea. 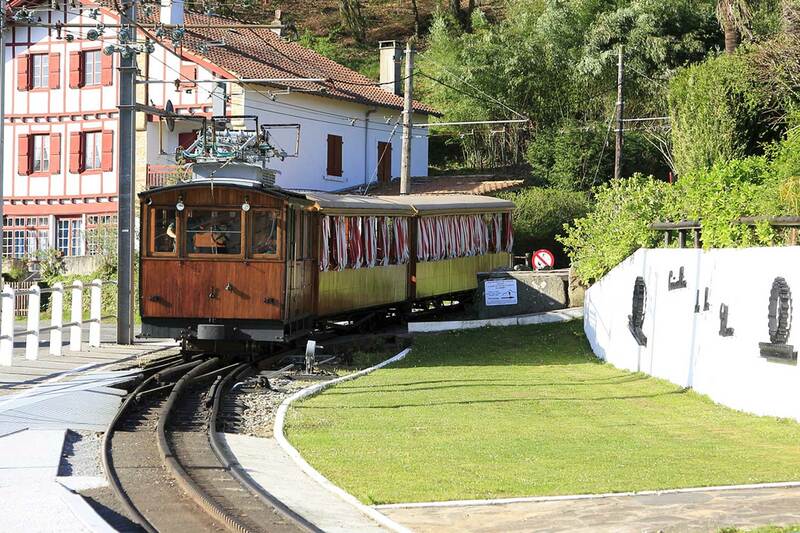 There is an aerial station at its top, and in 1924 the opening of a small rack railway that goes all the way to the top turned it into a main tourist attraction. Now, I know that I have repeatedly criticized tourists in the blog, and I try to steer clear of places like this, but just like with airplanes, I am a train geek, and I was not going to miss a visit to this one, so I parked the bike in a car park that was already getting busy with camper vans and coaches (oh my…) and went to buy a ticket. The station and the tracks dated from the time the train was built, and they had been kept in perfect condition. I was lucky enough to get a ticket to the next train, departing in ten minutes, as the journey takes 35 minutes each way and there are only two trains running on the tracks, so there is a departure every… you guessed, 35 minutes. I joined a big group of families with small overexcited kids and pensioner coach parties and jostled for position at the edge of the platform so I could take some pictures of the train as it ground its way into the station. 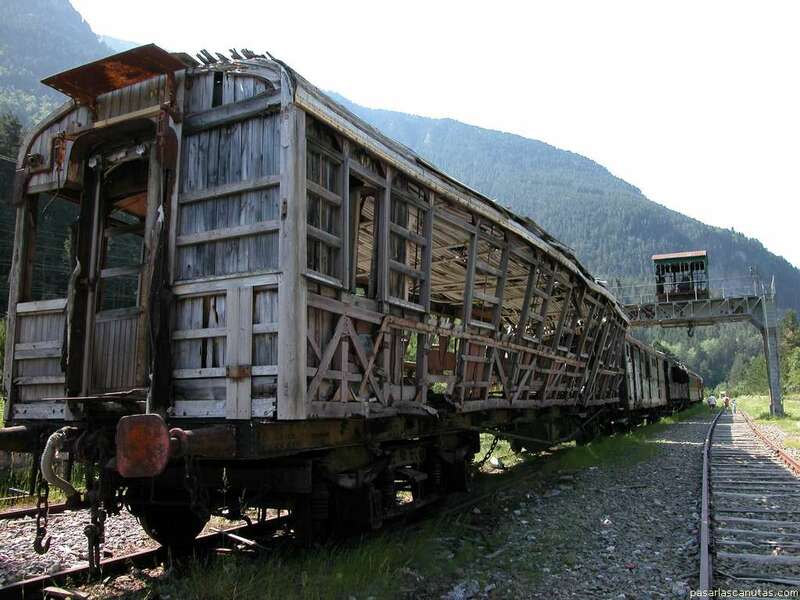 The rolling material is also original, a four-wheeled locomotive and two cars, all made of wood and as the rest of the elements of the line, they were in mint condition. The cars are covered, but they have no windows, so it was going to be a chilly ride; luckily I was wearing my riding clothes… which also protected me from the aggressive pushing and shoving of old ladies trying to get to sit next to the window in the car benches. 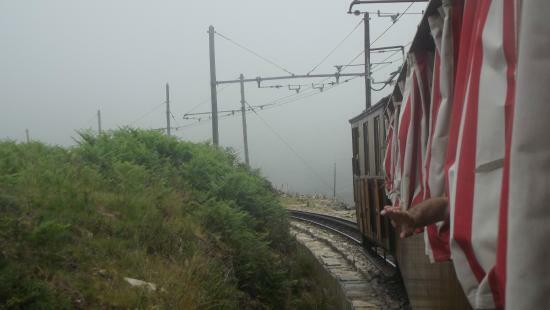 The train started its slow ascent of the mountain, the rack gear engaged from departure, as the tracks are steep even at the beginning of the journey, and at a constant speed of 9 km/h we left the station and headed into the forest. We left the trees behind quickly, and soon the views were marvellous. From this side of the mountain I could see the way I had come and the sea in the distance. Halfway up the train went round to the other side of the watershed, offering views inland, before coming to the halfway point where it stopped for a few minutes to wait for the other train coming down to pass before resuming its slow ascent. After a sharp left turn the track became really steep for the final stretch before the peak, and I saw to my dismay that it was completely covered in fog, and there would be no views from there. Indeed, a few metres up the tracks the train went into the fog and visibility was reduced to a few metres, the silhouettes of a cow grazing or of some hikers on the footpath that crossed the tracks at some points barely visible from time to time. I hit the road again, the day quickly improving, and soon I was riding through the quaint town of Zugarramurdi, famous for its witches, before passing Elizondo again and crossing the Col d’Ispéguy, reaching Saint-Jean-Pied-de-Port for the second time in the trip – this time from a different road, though – and taking the road that follows the same route that the brave pilgrims who decide to do the tough version of Camino de Santiago take: across the mountains to Roncesvalles, the main starting point of the Way on the Spanish side. The valley leading down to Roncesvalles is one of the most beautiful parts of the region, and thinking about the pilgrims slowly making their way through the forest I felt for the first time on this trip, that the motorbike was going too fast to fully appreciate it. I reached a main road that I took for a short while to cross to the next valley east, this time going up to the town of Larraun and from there the intention was to take what on the map looked like a small forest road that went past the Embalse de Irabiako, dipped into French territory for a corner and then went back to the main road to the next pass, Puerto de Larrau and Col d’Erroymendi, but it turned out that the road was a protected area, and I was stopped by a guard at a small wooden hut. I had to turn around and undo my way back to the main road, skipping that part. At least I had found a nice picnic and camping area near the hut where I had stopped to cook some lunch under a majestic oak tree. Past the Col d’Erroymendi I had to take a long detour into French territory not to repeat one of the roads I had ridden the day before and approach the next pass from a new road, so after taking the D918 to Aramits I took the D132 south, to ride up the area of Col de Soudet again, this time from the north. I had been here the previous day, shivering with cold and about to give up the route. The weather was much better now, and I stopped a few km short of the Col to take a rest, check the map and take a different road down. This was a wonderful spot, several mountain passes close together on the border that could be reached from different roads coming from the north, east, south or west. I had first arrived here from the south and gone west, and now I was coming from the north and going east. While I was thinking about all this, a camper van had parked nearby and the driver approached me. He turned out to be a fellow biker banished to a camper van by his girlfriend, and they wanted to know which was the best scenic route to cross to Spain. I showed him my “GPS”, a bunch of photocopies of road maps I had stapled together on which I had highlighted my route in different colours, and told him to take the same road I had taken previously before into the Bois d’Arbouty. Not Spain, but a very nice route. They had come up the road I was going to take now, the D441, and told me it was also a very beautiful one. I wished them a nice trip and headed down a very narrow road which was little more than a paved forest track. This was possibly the most remote part of all my route, and it was all the better for it. While the road was definitely not the best – it was narrow, the tarmac in bad condition and there were lots of loose cows – the landscape was stunning. Deep and narrow green valleys, dense vegetation, an abandoned stone house here and there, and not a soul in sight. A long and happy while later I joined the N134, the main road leading to the Spanish border. I had been here on holiday a long time ago as a child, camped for a couple of weeks in one of the many valleys that start to both sides of the road, and we had spent most of the time hiking. I remembered two things that had fascinated me at that time – and neither of them were the mountains. As I am writing these lines I realise that aside from being an airplane and a train geek I have many other weird tastes, chief among them is a love of abandoned places. Maybe because they are witness to a time long gone and they all seem to tell an interesting story, maybe because they provide excellent material for some of the best photographs you can take, but I have always been irresistibly attracted to them, and in this area were two that had left a strong impression in my childhood: the Fort du Portalet, and the Canfranc train station. 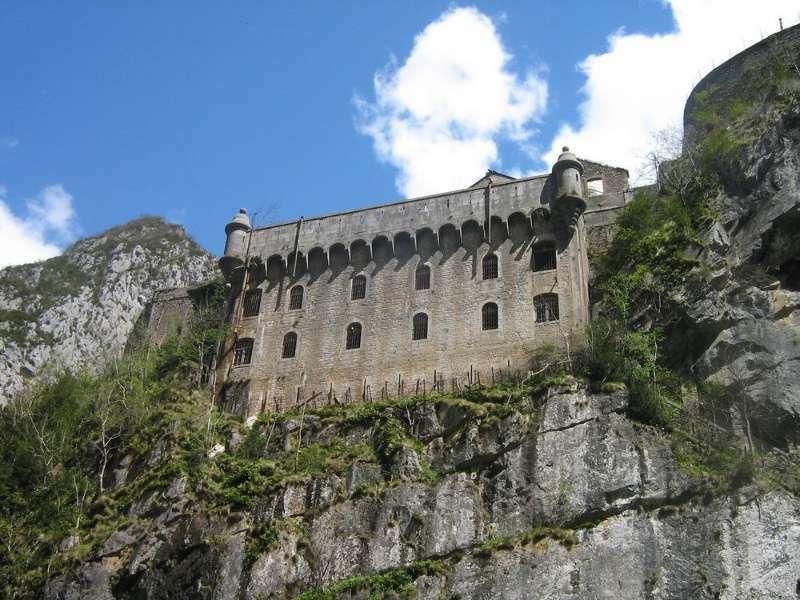 The first one was a fort built in the rock overlooking the road at one of the narrowest points in the gorge. It was built in 1842 to guard the border, it was used as a prison for political prisoners during WWII before it was abandoned. When I had visited as a child it was in a state of deep neglect, and I had spent hours exploring every corridor, observation point, staircase and dungeon with a flashlight. I was looking forward to seeing it again, but when I reached the bridge that led to it across the ravine a locked gate prevented me from getting any further. There seemed to be construction work going on, and I imagined that they were possibly restoring the fort with a view to open it to tourists. I later found out that the local authorities had bought it in 1999, and only now had they started to do something with it. The second place was Canfranc train station. 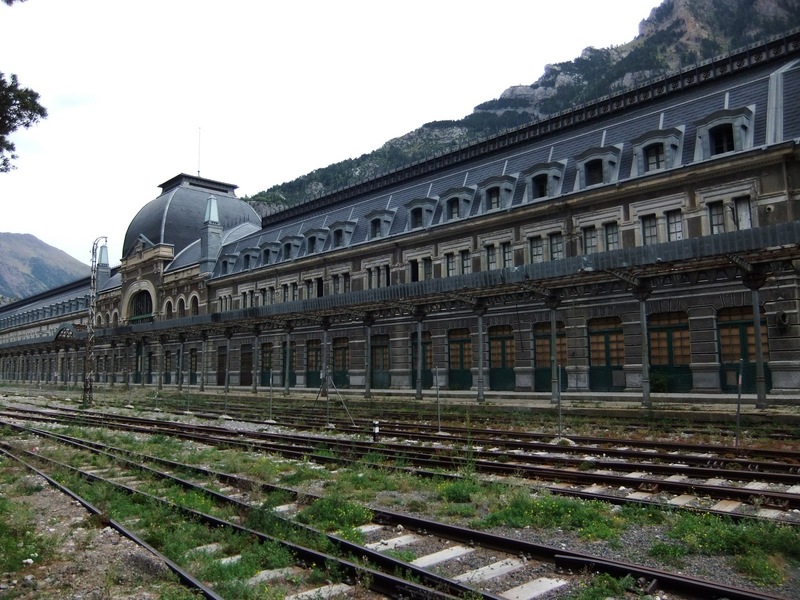 The station is a majestic 214-metre long building, a fine example of XIX Century architecture, set against a stunning background of snow-capped peaks in the heart of the Pyrenees. 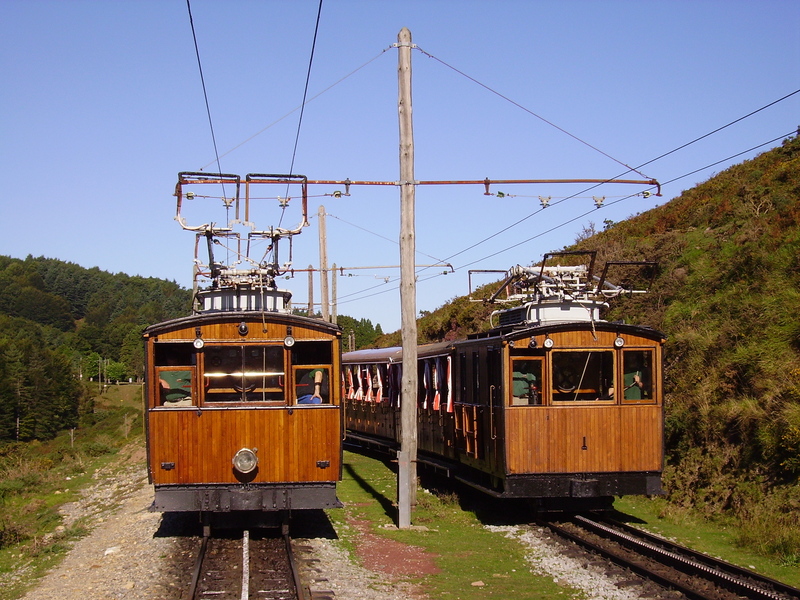 Built in 1928, it was to provide a third international railway connection between Spain and France, complementing the existing ones at either end of the Pyrenees, and has a fascinating story. It was taken under control of the fascist troops during the Spanish Civil War, and later on, during WWII, this railway line was used to send wolfram to Germany, which was used to reinforce the steel used in the construction of tanks, and in exchange consignments of gold from Switzerland were sent the other way. In 1970, a train crashed on the French side, badly damaging a bridge, and the line was closed on that side. Without an international connection to serve, traffic dwindled fast, and the station fell into disrepair. By the time I visited it there was only a regional train per day ending its journey at the station, and the yard was full of abandoned passenger and freight cars, rotting among overgrown weeds. As I rode my motorbike into the same yard I saw that most of the cars were still there, and most buildings were still accessible, but the station had had a fence erected around it. After years of studies and projects, they had finally started cleaning up and restoring the station a few years earlier, and now the building had a new roof that prevented further damage and it was possible to visit the inside on organised tours from early 2014. I spent a lot of time walking around and taking pictures, and when I was getting ready to leave something I noticed something I had not seen on my first visit many years ago. Far down the yard, the entrance to the tunnel that went under the Pyrenees, which had been walled up, was open, and I could make out a dim red light in it. I rode there and asked a guy who was walking his dog what was there. 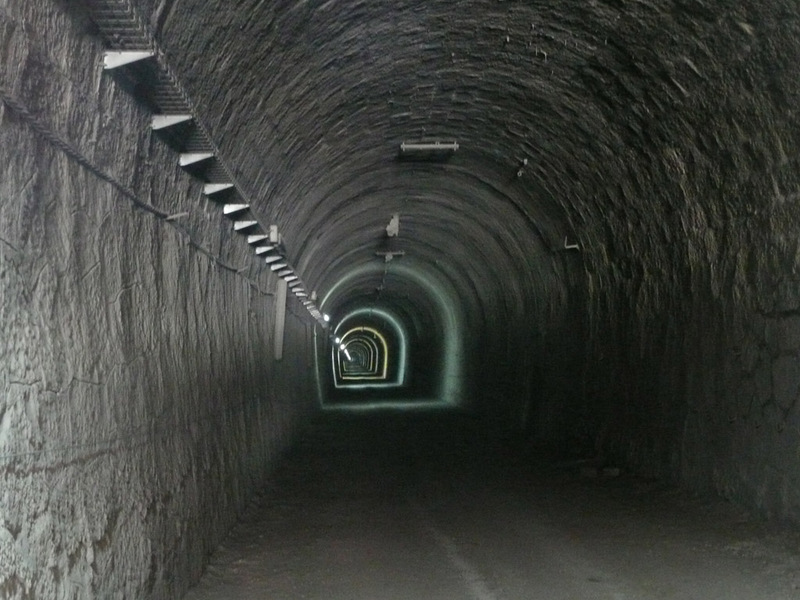 To my complete and total astonishment he told me that there was an underground laboratory there, and that I could park the bike by the entrance and walk about a hundred metres into the tunnel until the gate. 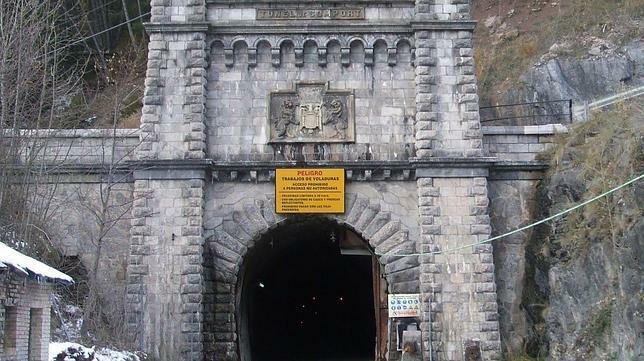 I found it hard to believe, but a while later there I was, deep into the tunnel, staring at a locked gate that was indeed, the entrance to a laboratory buried 850 metres deep under the Pyrenees that studied dark matter and something called rarely occurring natural phenomena… It sounded like something out of a James Bond movie! I left Canfranc heading south down the valley until I reached the main road between Jaca and Sabiñánigo, and then I turned north on the N-260a, a bit of road that I repeated from a previous day, but only until Biescas. There the road turned east for the last ride of the day – the 30 km of narrow twisting road along a gorge that took me to Broto, where I camped for the night. This entry was posted in Trans Pyrenees 2014, Travel and tagged Cabo Higer, Canfranc Station, Col d'Erroymendi, Col d'Ispéguy, Col de Soudet, Collado de Ibardin, Fort de Portalet, La Rhune by Kilian. Bookmark the permalink.